An effective museum doesn’t just display items drily in glass cases; an effective museum gives those items meaning to the people viewing them. It entertains, but it also makes visitors think. It gives the items an emotional weight. 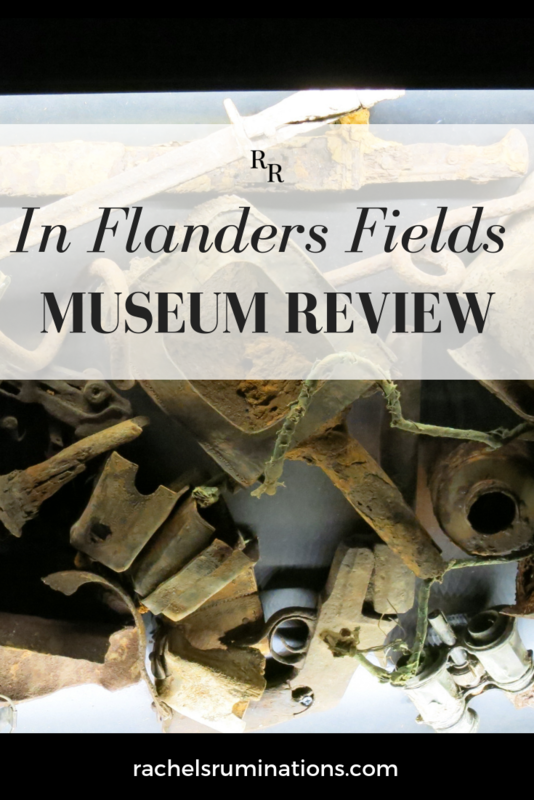 The In Flanders Fields Museum in Ypres, Belgium, is one of the most effective museums I’ve ever been to, and there aren’t many I’ve been to that fit my description: Ellis Island is another, as well as the Tenement Museum, both in New York City. Disclosure: This article contains affiliate links. If you make a purchase through one of them, I will receive a small commission. It will not affect your price. “In Flanders fields the poppies blow / Between the crosses, row on row.” Poppies have become a symbol of remembrance of World War I.
I’m not normally a museum person. I may find the topic interesting – modern art, say, or a particular period of history – but my attention span is short. An hour or so is generally the limit of my patience. I later tried the same tactic with my son, Robert, but he just wasn’t interested. Museums were “boring.” All of them. When he was about 15, we took a trip to Belgium and France, taking my niece along as well. She was about 13. I had heard that the In Flanders Fields Museum was good, and decided that we’d go there, even if Robert wasn’t interested. We were in Belgium because of him, after all, and his interest in the world wars. The In Flanders Fields Museum did not disappoint. It was engaging, moving, personal, yet included a lot of information as well. Items were displayed in glass cases, but there were also, for example, interactive maps on which you could compare and superimpose current overhead images of battle locations with the overhead photos from the war, complete with clearly visible bomb craters and destroyed buildings. One of the things this museum did well was to make the personal connection between the men and women involved in World War I in the Ypres Salient and the museum visitor. On entering, we were asked to enter basic information about ourselves in a computer, linked to an armband we’d been issued: our names, ages, genders and where we were from. That information was then used at various points in the museum to show the life stories of individuals who we were most likely to relate to. In my case, for instance, I got the profile of a woman from the US who worked as a nurse in field hospitals near Ypres and who died of a liver disease in 1918. The only picture I took inside; it wasn’t a very photographable museum. 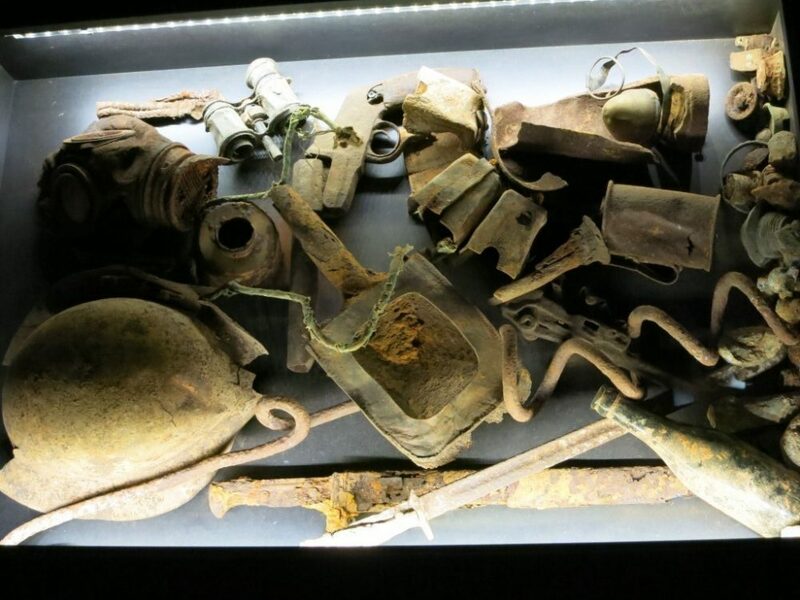 This shows items that were dug out of a muddy field quite recently. Scattered throughout the museum were cases displaying the personal items of individual soldiers who died in the war: a diary, a small sketch pad, a photograph of the family that they carried with them. This personal touch works far better than numbers, such as how many people died on a particular day in a particular battle. There were also films here and there with actors playing the parts of actual soldiers, looking straight at the camera, telling stories of their experiences: very dramatically presented against a black background, and speaking in their own languages. One group story-telling, involving an Englishman, a Frenchman, a Belgian and a German taking turns describing the Christmas truce of 1914, was particularly gripping. It nearly brought me to tears. I was pleased to see, too, that the Germans were not presented as the enemy. Germany may have been the aggressor, but in these exhibits, the common soldiers – Germans, Belgians, French, English, as well as colonial conscripts from all over the world – were all equally victims of this war. This row of buildings, seen from the tower above the museum, were all built in the early 1920’s. A more subtle aspect of this museum is the layout. It’s in a reconstructed medieval market hall with high vaulted ceilings – pretty much all buildings in Ypres are reconstructions, since the city was flattened by the series of battles that raged in, around and above it. The various parts of the exhibit are scattered around the long, wide hall. There’s a sequence to some extent in that the stages of the battles in the Ypres Salient are chronologically placed, but the displays on different topics – uniforms, gas attacks, weaponry, communications, trench warfare, tunneling, and so on – do not seem to be in any particular sequence. There isn’t a single route to move through all of the exhibits; the viewer chooses her own path. The effect of this, since everyone else in the museum is also choosing his or her own path, is a certain level of discomfort. I had to double back a couple of times, since following the exhibits more or less in a row on one side would lead me to skip exhibits elsewhere in the hall. I had to watch out for other people making unpredictable movements as well. It was a very subtle thing, but I suspect this was designed into the museum on purpose. One shouldn’t be too comfortable in a museum about something as horrifying, gruesome and costly (in terms of lives as well as money) as the battles in the Ypres Salient. If you’re ever in Belgium, go to this museum. You’ll spend several hours if you find it as gripping as I did. You might cry. You’ll certainly get a much clearer idea of what the soldiers and civilians went through who were swept into the chaos of the Ypres Salient. And you’ll be much better able to resist the glorification of war that is presented so often in the media. 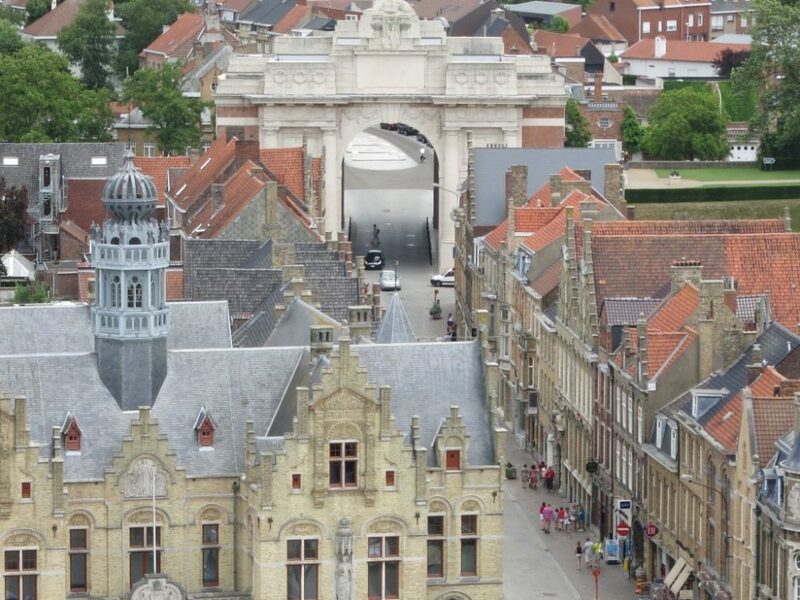 The Menin Gate is a memorial to all the Commonwealth soldiers buried in the Ypres Salient. At the exit gates, we noticed a row of simple banners hanging down from the ceiling. Here, after reading about all of these horrors of war, I realized that the words on the banners were lists: lists of every war that’s been fought since World War I. It was an impressively long list. The last banner ends with the Syrian war, but has ample space for more. Note that the town’s name, Ypres, is sometimes also spelled as Ieper. 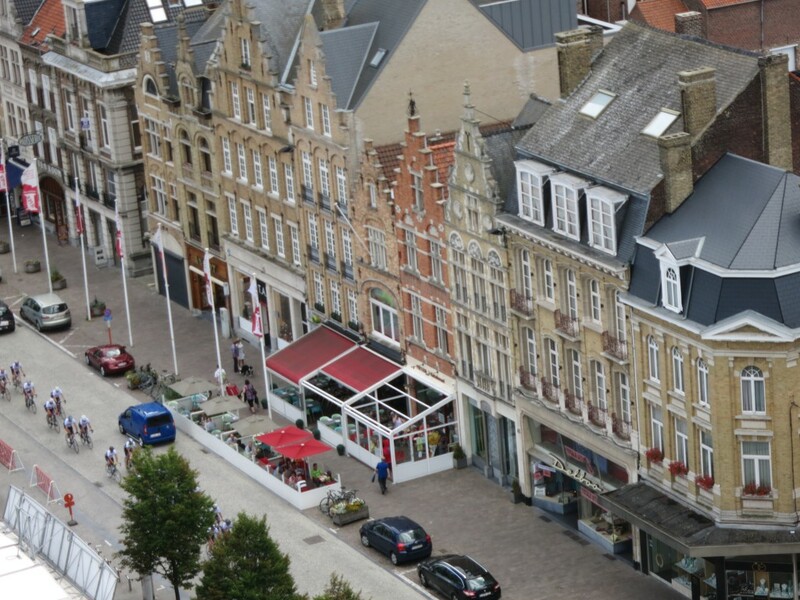 The museum is located in the Lakenhallen on the Grote Markt (main market square) in Ypres. Open mid-November-March Tuesday-Sunday, 10:00-17:00 and April-mid-November daily 10:00-18:00. Closed for most of January. Admission fee: €10 ($11.50) for the museum, €13 ($15) if you want to see temporary exhibits as well. Make sure, while you are there, to watch the Last Post ceremony at the Menin Gate. Get there by about 19:30. 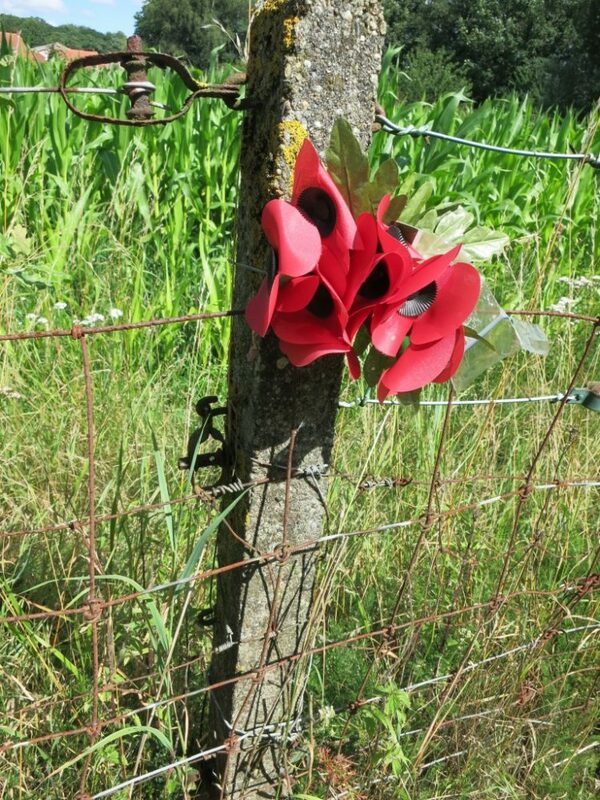 This all-day tour from Brussels includes a number of World War I sites related to the Ypres Salient, as well as a visit to the In Flanders Fields Museum. If you found this article interesting, please make sure to share it on social media! Wow Rachel, sounds like a fascinating place. My Grandfather, rest his soul, was in WWII and had a large collection of war photos along with some over seas stamps and currency collection from his travels through Egypt and such. It is so fascinating to go through all that stuff and see the history it presents. I think the reenactments are a great idea that inspire some visual learning about history. It’s too bad this one is so far away, me being in the southern U.S., I would love to check that place out. 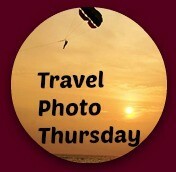 Thanks for sharing such great detail about your visit! I am not much of a museum person myself, but this sounds like a great one indeed, Rachel. It seems to me that the key is the emotional connection between the viewer and the object. You have that connection, Robert, because he was your grandfather. This museum creates that connection even though you don’t know the individual they’re portraying. Thanks for commenting! And you too, Delia, thanks for commenting!